On this day the 16th Ohio, with DeCourcey's Brigade and Morgan's Division, broke camp and left Red House at 6:00am. The troops marched about 10 miles and encountered the friendly forces of General Jacob D. Cox, who (apparently) had already reached and occupied Charleston. The Confederate forces, under Gen. Echols, had withdrawn. It must be pointed out that accounts differ as to the date Morgan's troops (and the 16th Ohio) reached Charleston. Some say they arrived there the same day, October 29, 1862, and others indicate they camped that night and reached Charleston the next day. It is hoped this conflict can be resolved and clarified but for purposes of this account, we will assume Morgan reached Charleston at 3:00pm on the 29th. Morgan's division would enjoy a peaceful stay in Charleston for 12 days. (on the) 29th, we again folded our tents and resumed the march , reaching Charleston that day. For miles before reaching the town, the scars of military occupation (were) strongly and painfully visible. Besides the common ruin that is left in the wake of armies, there (were) hastily built fortifications, where the small detachment had entrenched against the superior force - sometimes Federal, sometimes Confederate - weakened by an excessive draft of their numbers to reinforce the armies in some other locality, were compelled to stand at bay and fight at a ruinous disadvantage, or retreat and abandon great districts to the enemy. We passed a fortified knob called Tyler Hill . It was told us that here Col. Tyler, with his 7th O.V.I., had made a fierce stand against an army that greatly outnumbered his forces. Within cannon-shot of Charleston, commanding peaks were crowned with fresh-looking breastworks. At the town, Elk river empties into the Kanawha. The former stream was spanned by a neat suspension ridge now ruined. 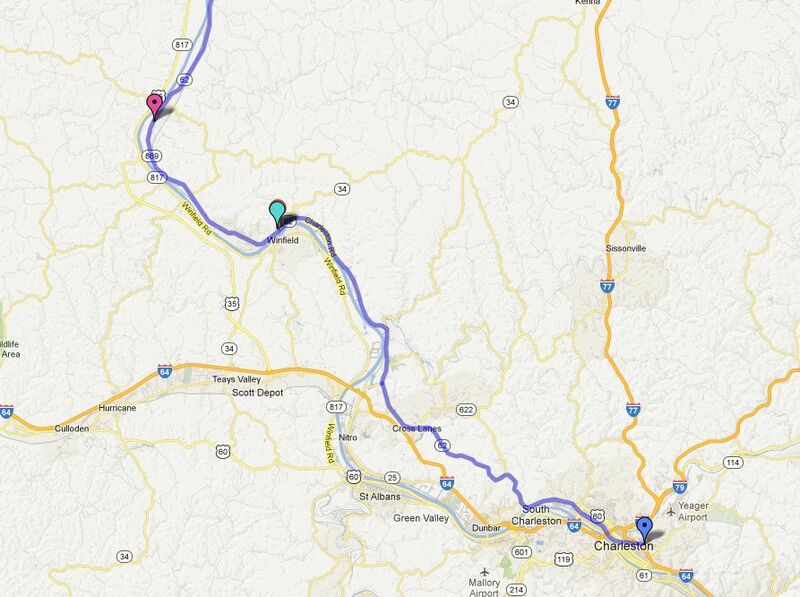 We located our camps on the east side of the river, about three-fourths of a mile from town. Good water was plenty, but fuel had to be hauled in from the hills. We suffered no inconvenience for any of the necessaries of camp life. Rations were good and sufficient, and we had ample facilities for cooking them well. DeCourcey was careful that we should not forget the tactics, so he kept us going through the tiresome work every day. * Some information and italicized quotations from a series of articles entitled Camp and Field - The Old 16th Ohio,, written in the 1880s by Theodore Wolbach, late Corporal in Company E, 16th Ohio Volunteer Infantry.